The year is rapidly coming to a close. 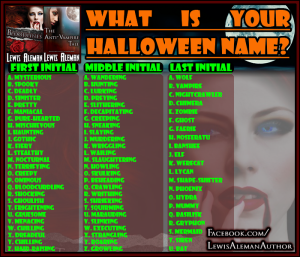 What is your Halloween Name?? 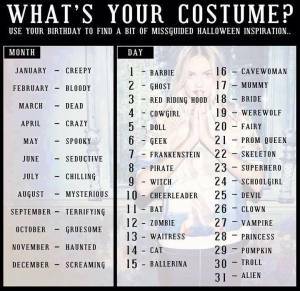 WHAT IS YOUR HALLOWEEN COSTUME TO BE? Everyone likes finding something they want that they don’t have to pay for, it’s a no brainer. Free books are plentiful, but they don’t always tell you the full story, sometimes they are just teaser and there’s nothing wrong with that. It gives you an opportunity to decide if you like the writer’s style and enjoy the book enough to want to buy the next in the series. Meanwhile, I have four books now in my free Legends series that I hope my readers will enjoy. I hope to have a fifth book out before the end of the year. I don’t know how many books will be in the Legend Series but when it concludes, I will start another free series. I wish happy reading for you all.